We’re huge fans of [Neal Stephenson’s] work and are usually looking to assign some of his vision to the gear that pops up in the real world. But there’s no stretching or squinting necessary with this one. [Kerry Scharfglass] has built a functioning Drummer’s Badge from the foundational Sci-Fi novel The Diamond Age. The badge is called Sympetrum, which is a genus of dragonfly. In explaining what the badge is and does, [Kerry] instructs you to go and read the book first and we couldn’t agree more. This isn’t recommended reading; if you’re a geek you need to read this book. The dragonfly badges are from a portion of the book that gets pretty weird, but the gist is that rod-logic (machines build from microscopic carbon nanotubes) is so pervasive that at all times you’re covered in mites that are actually machines. At a party, one of the characters notices everyone is wearing dragonfly pins that begin to pulse with the music and synchronize with each other. They’re actually indicators of what the mites within the wearers’ bodies are doing — synchronizing people with other people. This badge is a working recreation of that, presumably without the billions of mites controlling people (but who knows, it is DEF CON). At the center of the badge is an STM32 driving ten APA102 modules. Interactivity is based on IR signaling. The badge will cycle random color animations when alone. But each badge also projects clock sync and metadata over infrared, so put some of them in the same room and they’ll tend to synchronize. Simple, beautiful, and a great geeky backstory. This example of Badgelife proves that hardware badges don’t need to be packed with features, or have a huge BOM cost. If done well, you can do an awful lot with just a little hardware and strong dose of inspiration. It also makes hand-assembly a lot more approachable, which is what you can see in the images above. Thanks [Kerry] for giving us an early look at this badge, can’t wait to see them at the CON. We don’t remember hearing about the One Laptop Per Child initiative distributing tablet computers but apparently a couple of shipments were distributed to rural communities in Ethiopia. The problem one might think of in this scenario is that the literacy rate in the two test villages was basically zero. But that’s exactly the population targeted with thr technology. The tablets were loaded with a software package called Nell. It was designed to guide a child in self learning by telling them engaging stories that include teachable moments. If you check out the white paper (PDF) you’ll find it’s pretty much the exact same teaching technique that [Neal Stephenson] wrote about in his book The Diamond Age. But keep reading that paper and you’ll see that this is because the researchers took their inspiration from that very novel. Well the results are in and apparently [Neal] knows exactly what he is talking about. Not only did the children learn from the software, but within five months they were hacking the device (which runs Android) to get the disabled camera working. What’s better than one amazingly acrobatic quadcopter? 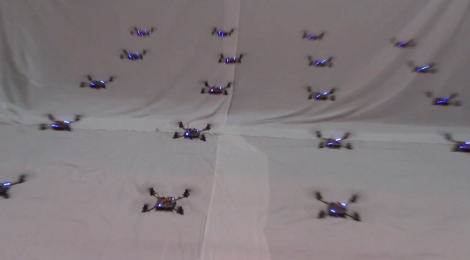 How about a swarm of acrobatic micro-quadcopters? It’s not a rhetorical question, but an experimental reality. A team at the University of Pennsylvania are showing off their latest round of hovering robots which can move in formation and alter their orientation as a swarm. You may remember us salivating over the unbelievable stunts the team pulled off with a single ‘copter back in 2010. That device needed a sophisticated camera installation to give provide feedback, and this uses the same framework. But we don’t that detracts from the achievement; it’s simply a future hurdle for the project. The video after the break shows some of the stunts the slew of whirring devices are capable of. Watching them move as a grid, and even landing simultaneously, we can’t help but think of the Dog Pod Grid from Neal Stephenson’s book The Diamond Age. It was used as a protection system, keeping unwanted flying intruders out. Doesn’t sound so far-fetched any more, does it?